bassman is hannes strobl, an extraordinary musician and composer, who is also half of the berlin based electronic-duo paloma. both as solo artist and with his band paloma, bassman has managed to develop various new techniques and methods over the years and certainly taken the electronica sound to the next level by plucking fresh electronic sounds into his complex arrangements with his contra- and electro-bass. 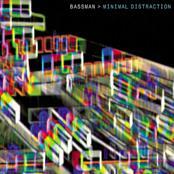 minimal distraction – the bassman debut-album! “album of the month”….a fantastic and melodic new album: “minimal distraction”. bassman has used his experience working with rupert huber (the genius behind tosca with richard dorfmeister), to create an atmosphere that tosca fans will recognise and love. one of the best new artists of the moment….” (MODZIK Magazine / france) bassman aka hannes strobl is in high demand as a performing musician, not only in his hometown of berlin but across europe and the usa. his dizzying amount of solo releases has caused a stir almost as much as his electronica duo paloma, the other half of which is hanno leichtmann (releases on city centre offices, morr music). this dynamic partnership has just released “sometimes we love you truly” which features clara hill from jazzanova and newcomer erik butts on vocals. bassman´s energetic live-performances have been widely received and paved the way to work in radio, theatre, dance and film as well as collaborating with various national & international artists. bassman is always searching to create new sounds on his contra and electro-bass, and provides refreshing musical input into a scene where computerised manipulation of sound is nothing new. this exploration of a live electronic instrument is bassman’s unique voice and has gained him a huge amount of deserved recognition. after his first superb solo-ep ‘doorpusher’ which made a buzz on europe’s radio stations such as austria’s radio fm4, england’s radio xfm, bbc, scotland’s radio magnetic and many more, he finally releases his brilliant debut album called ‘minimal distraction’. it is his first solo album released on fabrique records mixing up crusty and soulful lyrics with funky, rollin´ broken-beats, tough cut breaks and twisted dub flavoured electronica. a surefire dancefloor winner is ‘big fun’ featuring justine electra’s sweet and melodic vocal line. the deadly ‘play’ and ‘raindub’ encompass bassman’s irresistible down beat touch, and although a slower groove they exert so much funk that the crowd have to move. in contrast, the track ‘i am another person’ is a drum and bass influenced midtempo shaker with a gritty bass line, at the hands of bassman himself. the wonderfully structured title track and atmospheric ‘feldman dub’ takes you to the endless depths of johannes strobl’s synthscapes and melodic intent. “minimal distraction” out now on cd/2lp!